This first one was inspired by the SU-per challenge of this week: a sketch! Next I made a card inspired by the A/W catalogue p8. Then I wanted to make a card that would fit in one of those long envelopes. So I measured it and decided my card would have to be 10.5 x 21 to fit inside. So I cut my Real Red into 21cm x 21cm and scored at 10.5cm. I then cut some Mossy Meadow Cardstock at 20.5 x 10, and the DSP at 20 x 9.5. I cut out the middle of the Mossy Meadow to use later. I tied the ribbon around the DSP and stuck it down. Then I stamped the sentiment twice, once in Mossy Meadow and another in Cherry Cobbler. I cut them out at 5.5 and 5cm. I cut out the "season" from the red one and stuck it over the green one. Then I cut more Mossy Meadow at 6x5.5 and Real Red at 6.5 x 5cm. I added some Iced Rhinestones as embellishment under the sentiment. As you can see they're slightly more minimalistic and a lot less "busy" in terms of colour schemes. I started with some Kraft paper, cut at 14.9 x 10.5 (half an a4). I cut some Very Vanilla at 14.4 x 10 and the DSP at 13.9 x 9.5. I tied the string around the DSP twice and folded it into a double bow. I then stamped the sentiment onto the Very vanilla piece with Versamark and heat embossed with gold embossing powder. I then cut it out with my cuttlebug and oval dies. I cut the scalloped oval out of a piece of scrap kraft paper. Then I adhered everything to the card. This time I used Pool Party as a base (standard size). I cut out some Whisper White at 14.4 x 10 and embossed with my cuttlebug. I cut out more Pool Party cardstock at 7x13, 9.5 x 7.5 and 7x1.2. I cut out more Whisper White at 9x7 and stamped it with the house and Santa Sleigh in Memento Ink. I then stamped some versamark on the bottom and added my iridescent powder to get the snowy effect on the floor. I did the same with the trees and the house (glue pen). I then used the snowflake stamp from Perpetual Birthday Calendar and also stamped that with versamark and again heat embossed with iridescent powder. On some scrap Whisper White I stamped the sentiment and cut it out. I added some Pool Party candy dots and stuck it down with stampin' Dimensionals. I hope this has been inspiring :) and see you next time! Gorgeous Cards! You can never be to prepared for Christmas! 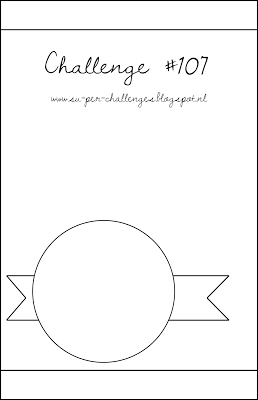 Thank you for playing along at SU-per Challenges! Thanks for joining us at SU-per challenges. Great cards. Je bent druk bezig geweest Marcia, leuk !! Bedankt voor het meedoen met SU-per ! Zooo wat een productie! Leuk dat je meedeed aan de SU-per Challenges!